Sociable Soccer is a game made by Tower Studios and Combo-Breaker, and was released on Steam Early Access for PC on the 12th of October 2017. Development is ongoing. Mobile (iOS & Android) and console versions for PS4 and Xbox One will follow later. Release dates to be announced. Do you maybe have some news when the release of Sociable Soccer for 1) Android phones and tablets and 2) for the Samsung Gear VR will happen? It is very silent since January so hope there is still active development and Sociable Soccer will still soon be launched on those platforms. please keep up the great work! when it will be out the Android version? can someone tell mr hare that i’m so grateful for the sensible soccer? It made an unforgettable mark among my childhood memories. i’m 34 yrs old now and Sensible Soccer is still my favorite football game. I really don’t care about graphics at all, what matters is what sensible soccer offers, simple graphics but the amazing and entertaining gameplay! I just read the announcement about the cooperation with the billion dollar Chinese company. In the article it is mentioned you can pick a team from 6 leagues. Does this mean the Dutch competition is not included anymore? According to earlier communication with Sociable Soccer staff they mentioned that Feyenoord will be included with lots of legendary players. I am confused now. This is specifically for the Chinese version and the leagues they want in. It does not affect the out of China/Asia versions. Ah okay very clear. Nice to hear all the legendary players will still be in 🙂 Will the Europe version also be released this autumn? And will it still come on the Gear VR? The announcement back then that it will be on Gear VR was one of the reasons I purchased the Gear VR so really can’t wait till the release. Looking forward very much. Hi, we are looking at potential publishers (Gamescom) on the mobile market in Europe and America, but nothing concrete yet. If we get one we’ll announce it later this autumn. Cheers Rutger. Nothing concrete? Are those publishers sleeping? They are crazy if they won’t get on it quickly before an other publisher does it. The potential customer base can be massive. All Sensible Soccer players from the past want to play it and for new players it will be also very interesting. Pity I am not a publisher. There’s been no update since March, is there a problem. any news for the android version? Hi user0! It’s being worked on parallel to all other versions. We’ll have news shortly. Good Morning! I wonder if there will be support for the Portuguese-Brazilian language in the game? 1. Any news on the Android version? 2. Any chance for legendary teams, or one or more team of legends (like the Classic XI in FIFA, you know what I mean?)? 3. When is the editor coming, and what will we be able to do in it? I don’t really mind if it’s not as complete as PES because the generic badges aren’t bad at all; I’d only feel miffed if it turned out half-assed. 4. Is there going to be a Portuguese language option? 5. How is animation work going? I know the game will still be top-down as it should, and SS is more about the action than looking like a TV broadcast, but being made in 3D, from what I saw in the videos, I think some stuff deserves more work, like keeper reactions and goal celebrations – and even the opposite, the team that conceded a goal or lost a match should look disappointed. Just a few pointers. Anyway, I guess I’ll wait for the full game to see it all for myself. I’m a sucker for large football games like this (like I was for SWOS) and I’ve already wishlisted “SocSoc” on Steam. So, kudos to you guys, all the way! 1. Work is ongoing on the android version, it will be out during the first part of 2018 we believe. 2. We have tons of legendary squads in there. When we have time we will hopefully make them all playable. 3. The first version of the editor will basically be name editing for teams and players. There are so many priorities before this but when we have it as a priority it will get the same focus as everything else. 4. Most probably yes. Still need to finish the game in english. 5. The animations need work, and for that we need an animation specialist. We hope to add that position to the team starting next year. Thanks for all your questions. They will be largely discussed when gameplay is more finished. Will there be Turkish language support in the game? Yes, eventually. When the time is right for additional language support we will inform everyone on social media. Cheers! Gutted that Early Access has been delayed a week, still good things come to those who wait. One of the first to buy, can’t play as yet, joypad doesn’t work, looks good though, disappointed there’s no option to play with one button as promised, hope this will follow soon. Hi Andy, the one-button does all will be an add-on to the current scheme of controls, if it happens. Jon is not very found of it, but we have to have it for mobile so I guess we will have it for the other platforms too so that users play with the same conditions. Jon has last word on this. There’s a fix coming for controllers, because our game is only reacting to the controller which is 0 on Steam Settings/Controllers. If you take away other controllers setup in Steam and only use one, it should work as temporary solution. will there be a linux/steam version, too? Hi Max! We are looking at other platforms. But for now it is the platforms we have announced. All platforms that support Unity have a potential for a release. If we decide to release on Linux we will announce it here and on other social media. Cheers. Thank you very much for your answer. Damage, that I have to wait. Do you know when you will decide to support linux? 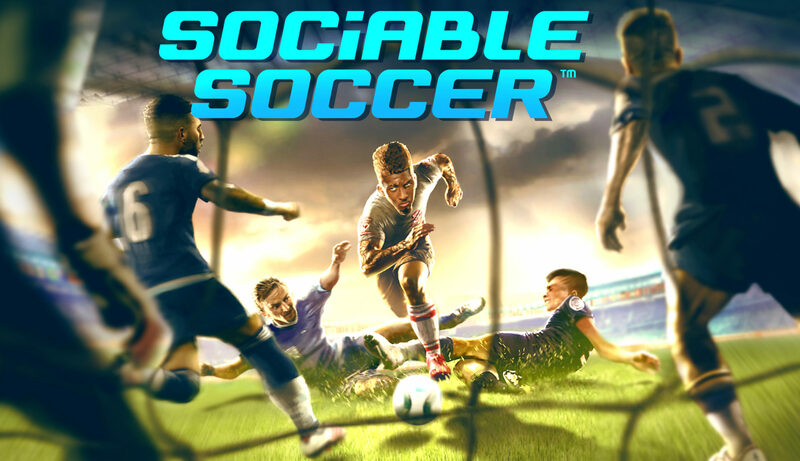 I would love to buy sociable soccer Early access (perhaps it works under Wine/Codeweavers Crossover and so is useful even before a native linux port?) but linux support would be very important for me. Just as you say you defintely support Linux, I will buy the game, even if I have to wait some time for the release!!! This answer came on my question how it will perform on Gear VR because I read a review about Sociable Soccer on Gear VR. Last month I bought a Gear VR kit especially for playing Sociable Soccer when it comes out. I really thought it would become awesome on VR. I am really surprised that there was now mentioned that there still has to be made a decision about the VR version. I feel misleaded and really thought there would come a VR version because of that you told me on this site. Hi Eensie. If you read it on Steam then it is about the Steam PC version. As soon as we get the game in place we will add functionality for PC, Android, PSVR and similar. Cheers. Ah…that explains a lot. Was worried already 😉 You write about PSVR , but you also mean GearVR right? Because that was confirmed earlier to me in this /about section. Really hope so. That’s good to hear. I am really looking forward to play it on the Gear VR. If you need more testers for the Gear VR version, then please send me a mail and I would be very glad to help. Hi SFDELL, you can get it on Steam Early Access from the 12 of October. Cheers! Just watched the latest video again at half speed, what an option that would be. Yes the iOS version will be very important for us, happy to see you are interested. We have not yet thought so far. It depends on resources I guess, but we’ll do everything we can that is possible. I would like to do an article on your next title. But i need to know if sociable soccer will be officially compatible with the PSVR ? My PS3 is Superslim- so unlike my Rasperry PI- no Commodore Amiga emulation. Hi Florian. We have no plans for a PS3 version. A PS4 version has been announced and the game is coming for PC, Android and iOS, hope you have another option. Cheers! Hi, how will be the performance on Samsung Gear VR? Will it be really good? I read a review about Sociable Soccer on Gear VR that someone tested it but that there were still some issues. However that was already some time ago. Will it be perfectly working upon released? And can it be played well on the Gear VR or does someone playing on Gear VR have a disadvantage in terms of chances of winning against someone playing on the pc, because it is more difficult to control on Gear VR? Last question…it will be also possible to play on tablet? So pc, tablet, mobile and Gear VR? Looking forward hearing from you! The VR version is an addon to the normal game. It is not a version which we put our main focus on. It just happened to be easy to implement for our devs. The VR game is developed to be played with a bluetooth controller just like the PC and console versions so there are no disadvantages. All the versions are compatible in network multiplayer as long as the different platforms allow it. That is not up to us to decide, but it works in development. That’s very good to hear. Really looking forward to the VR edition. Will it be only released for the Samsung Gear VR or is it also playable on Google Daydream? when its coming out (Android) ? This year, we will have more news around Gamescom in August. oh and please… only one button to play!!! Hi Antonio. There will be an option to play with only one button and on mobile this will be the only (touch) way unless you play with a Bluetooth or USB-C controller. Hi, I really loved Sensible Soccer. Therefore I am looking forward very much to the release of Sociable Soccer. I also read that the clubs will include some classic players which can be unlocked. My favourite club is Feyenoord. Of course everyone knows the legendary player Henrik Larsson but will those cult figures be also included? Those are by far the most popular Feyenoord players of the last decade and are all cult figures. Ulrich van Gobbel: more than 220 matches for Feyenoord. And one of the fastest players the Dutch competition ever had. Also a very tough defender. Regi Blinker: also superfast and played 238 matches for Feyenoord. Famous for his rushes and his long dreadlocks. Mike Obiku: supersub striker. Extremely strong, fast and muscled. Always laughing. Joszef Kiprich: still one of the biggest cult figures. Scored a lot for Feyenoord and called him the sorcerer of Tatabanya. Gaston Taument: also a very fast winger famous for his long hair. Henk Fraser: one of the toughest defender ever in the Dutch competition. Chris Gyan: one of the smallest defenders in the Dutch competition which played superb during the 2002 win of the UEFA cup. Despite his short length famous for easily out jumping Jan Koller of Dortmund during the final. Those are on of the most famous cult figures ever for Feyenoord. Is there a possibility to include them in the game? Hope this feedback comes in handy! Thanks in advance! Hi Eensie! Thanks for supporting us! We will have more than 30 Feyenoord legends to unlock. Wow you mention some pretty awesome Feyenoord legends. Really cool! Do you know if Regi Blinker and Mike Obiku are also on the list :)? They were also in the old Sensible Soccer game 🙂 I am really curious of which players the full list consists but I understand I have to wait some more time. And not Feyenoord related…but will the legendary Argentinian players Claudio Caniggia and Diego Maradona also be included in the game? Can’t wait to start playing the game. Do you already know in which month the game will be released? They’re not, they just go through a massive spam filter. It’s been pretty quiet recently, hope things are progressing well, any news on a release date. Yes, it’s because of the reasons mentioned in the latest post. Sometime during 2017 is the new release date. We won’t release the game until it is good enough. Concerning the game physics I think it’s worth consideration to look what for example another similar type arcade sports game NHL Hitz Pro did. That game included many dozen sliders for physics and A.I behaviour. They even have a slider for ‘puck retention’, which is less evidently remarkable in terms of how it affects the game compared to swos/kick-off/sociable soccer. I brought this retention setting up, because that’s something I would like to see experimented on. Swos had players with the C attribute marking that those players had more control of the ball than those that didn’t, in kick-off all players had less control (iirc), in videos from sociable soccer players seem to have a good control of the ball. Considering a scenario where a Sociable soccer sub-community focusing on the possible slower and more ‘realistic’ sliders (from above paragraph) would end up being competitive online with tournaments etc. In this scenario the player control features would become also relevant. Control settings like having the 1 ) manual control, player changes automatically on ball possession and air balls, manually without the ball. 2) Locking your player to one position for the full game. 3) ‘Fixed’ player control option from PES (this type of fixed lacks in FIFA). Fixed position I mean here is such that you only switch the player when you initiate a switch player trigger (eg. pressing a button, or in one button setup maybe some double click?). In the latests PES’s you could even change the player while dribbling, giving the ball possessors control to AI, and then make a run with a ball without a ball. Although this Sociable soccer seem fast paced, a feature like this would allow more strategy and possibilities. There are good examples especially in the recent fifa and nhl games. The nhl 2014/2015, also hearthstone (maybe nhl 16 has it too?) style ranked game mode where you start with the lowest rank and rank up the more you play, and eventually get stuck at some ranks as you gain or lose points depending how well you play. You are matched up with other players around the same rank (if available) randomly. Micro-transactions -wise the FUT concept seems appealing. Competitive players and the fantasy team builders uniting to the same place. The integrated card game with Sociable Soccer style caricatures in cards sounds like potential. If one goes the route without giving user the optional settings for things like game speed, camera zoom, some game physics perhaps and other things, then there is just the larger margin for not satisfying the wide range of preferences the players wish. The approach we’re taking internally is very much like “dozens of sliders”, and the reason all players seem to have such a good grip on the ball is that we haven’t implemented the player skills yet. We do have all the data for SWOS equivalent variation for all teams in the game, and many parameters are still due to change as we balance the game. Discovering this optimal balance of sliders (or, numbers) is a task that in the case of Sociable Soccer falls primarily on Jon, because only one person can have a consistent feel for the whole thing. We trust him with this job for the obvious reason, he brought us Sensible Soccer and SWOS. We’re not planning at this point to make the values user-adjustable, largely for the reason that with so many interconnected parameters the range in which *everything* works is actually very narrow. While some individuals will always disagree with some parameters of the game, making meaningful changes to them might actually be impossible. We can also make use of of facts like how long the ball takes to travel across the field, how far a slide tackle reaches or what the aftertouch limits are to optimize online gameplay to flow well in all situations. Jon is like a master chef preparing a dish for all to enjoy – shipping it with a crate of spices and telling you to season it for yourself would feel something of a cop-out. Additionally, if we make the parameters adjustable we would not be able to guarantee a consistent experience, and some of the subtler gameplay aspects might only become apparent after several days of play. If you were to change things to your own peferences early in the beginning, you might run into something that blocks your enjoyment a few days later and there would be nothing we can do to save you from that disappointment. What we can and will do, is to extensively play-test every change in the game with Jon, only keep the parameters that work and roll back to the previous settings if we take a step in the wrong direction. While adjustable parameters could let a bigger margin of people tinker with the game, they would not guarantee the optimal experience for anyone. Whether some of these parameters are opened up post-release for the modding community remains to be seen, but we believe it really is our job to make this the best damn soccer game on the planet to begin with. So there is an option to play with one button, I’m very pleased to hear this. …or have I read it wrong! Okay Caniggia thanks for the quick reply, I certainly trust in Jon. This was supposed to be a one button game, whats this about a sprint button! I’m with you Davide, the more options the better, the one I really want is a speed of play option. i’d like to know everything about in-game editor/s. Will it be possible to edit teams / players / competitions? and, if yes, how deep? I’m an editor and I love to edit football games! I have lots of ideas about this aspect of the game. At the present the only thing you can edit is Team Names and Team Players. The focus right now is only about gameplay and it will probably be like that until the end of the year. The remaining focus will be on other stuff. Tnks fr yr prompt reply! One of the coolest features (and I bet also key of success) of SWOS games was the total (for that time) freedom in customization. I hope it’s planned to focus properly on this particular aspect of the game when gameplay is complete. Could you confirm me if it’s planned to be a key feature or not? (even if it’s not yet developed). Thanks a lot! I was hoping to have at least the same options of the SWOS saga. It would be really cool to have a fully customizable database of Leagues, Teams and Players (I mean, even with basic options ((ae. for player editor, just color of players skin, hair and boots)) which could be easily and quickly edited. Even for team kits and badges, i dreamed of the classic SWOS quick and fast editor enhanced with lots of kit designs and a fully customizable rgb palette for colors. Let’s hope publisher decision will be wise. A spiritual successor of SWOS cannot forget / miss / ignore a so “distinctive” feature of the series. P.S. Please update us on this point, in the FAQ section of this site it’s said: “Q: Can you edit the teams? We can’t say much at this point since we haven’t created the edit modes yet. When we are there we’ll let u know. Cheers! What about goal celebrations and Trophy presentations on the pitch when you’ve won the League or a Cup competition. Good ideas. We haven’t come this long yet. Players can already have more than one position, so that has been looked at. Thanks. Thanks Caniggia, looking forward to hearing more about the game. Rather than deeming a player to be a Right Back (RB) or Left Back (LB), make Defenders (D) become a (RB) if they play on the extreme right of the defence or (LB) if they play on the extreme left, the same for Midfielders (M) playing on the Right (RW) or Left (LW) wing. Chelsea are a good example of this, Azpilicueta is a right footed defender who sometimes plays at Right Back but mainly plays at Left Back, Ivanovic is a defender who mainly plays at Right Back but sometimes plays at Centre Back. Sorry to be a pain, but you did ask for suggestions. Thanks for the quick response, I’m only trying to help make the game a success. Thanks again, my view is, the more options the more variety, the more variety the greater appeal to a larger clientele. I apologise if I am repeating my-self, but I have been waiting for a game like this for years and obviously want it to be a huge success. If I had known about the Kickstarter campaign I would have surely donated, but I didn’t find out till after it had closed. Our point of view is that the users have all those options in both FIFA and PES, but usually they go for the options that gives them most reward. Like the auto pass or the auto shot. People rarely use the options that create simulation. If PES/FIFA REALLY wanted to create simulation they’d force the users to play their game without easy controls. That would make for a great football game based on actual skill. The standard speed of the game will be that of SWOS. Everything else is undecided. I’ll keep you updated and let’s look forward to how things look when the speed stats are in place. What you saw in the video was probably top speed (at least to me). Players are yet to get their speed stats yet. When they do the players will slow down considerably. Sociable Soccer is an arcade game, the other games on the market do a great job with the simulation and a lot of options for example speed, controls etc. Although I loved Sensible, the Side view was always my prefered choice, but the one thing that bothered me was not being able to slow the game down to a more realistic pace. If this was an option it would blow the other Football games, you know who I mean, out of the water. I do hope you consider this. Thanks for the reply, keep up the Great work. Hi, great work, will you have the option to slow down or speed up the pace of the game and is there an option to zoom in or out. Thanks for bringing game play back to Football. Hey Pablo. Thanks. You will get to play this later this year!